As well as using the detail view to set allocations, you can also edit an opportunity item to manually set or change them. This is especially handy for cases when you need to have a mix of sub-rent products and assets from your own stock. You can set allocations on provisional quotations, reserved quotations, or orders. If you’re working on a draft or open quotation, convert to a quotation or mark as provisional or reserved. To adjust stock allocations, edit an opportunity item by clicking the blue arrow to the right and choosing Edit from the menu. In the “Stock Allocations” section, you’ll see a list of any allocations made so far. 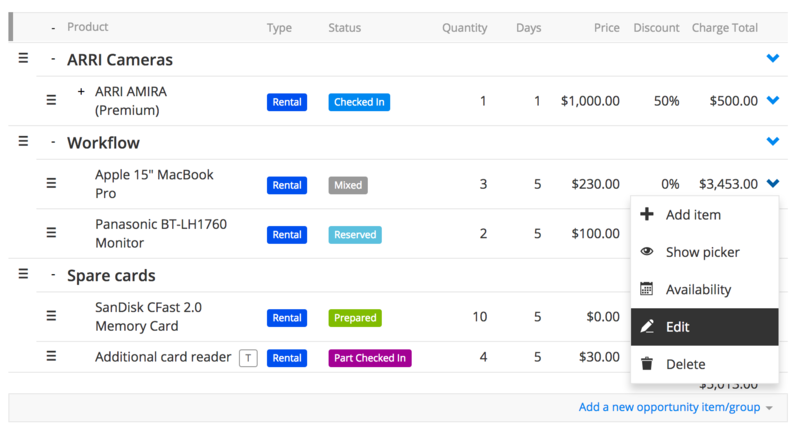 If you’re working with a bulk stock item and nothing has been allocated so far, you’ll see “Group Booking”. Hi the green add allocation button to add an allocation. In the drop-down box, you can choose from a list of available and unavailable stock levels. The number of allocations you add shouldn’t be greater than the quantity at the top of this screen. Click the red cross next to an item to delete it from the list. You can reset all allocations by using the reset allocations button. 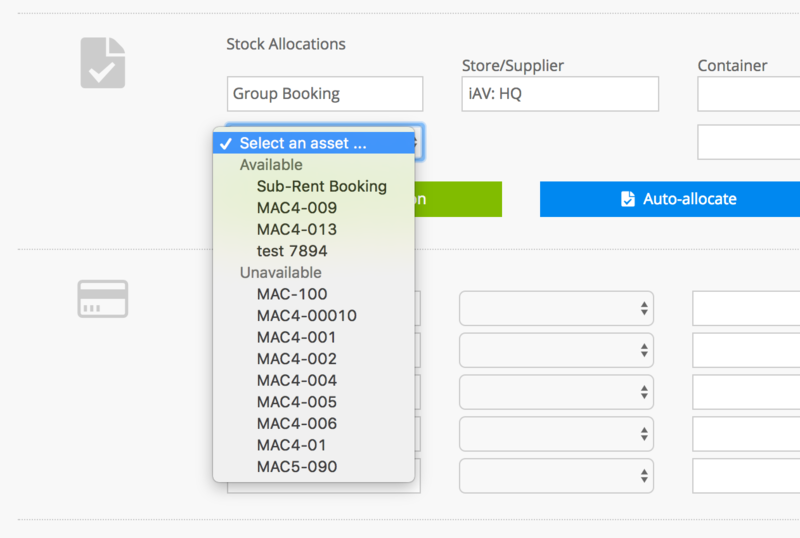 Choose auto-allocate to let Current RMS automatically choose the next available asset and allocate it to the opportunity item. If you add an allocation manually then auto-allocate, Current RMS will auto-allocate the next available asset after the one you allocated manually. For example, if you have assets CUR-001 to CUR-010, manually allocate CUR-004, then auto-allocate, the next asset selected will be CUR-005 provided it is available – even if CUR-001 is available.